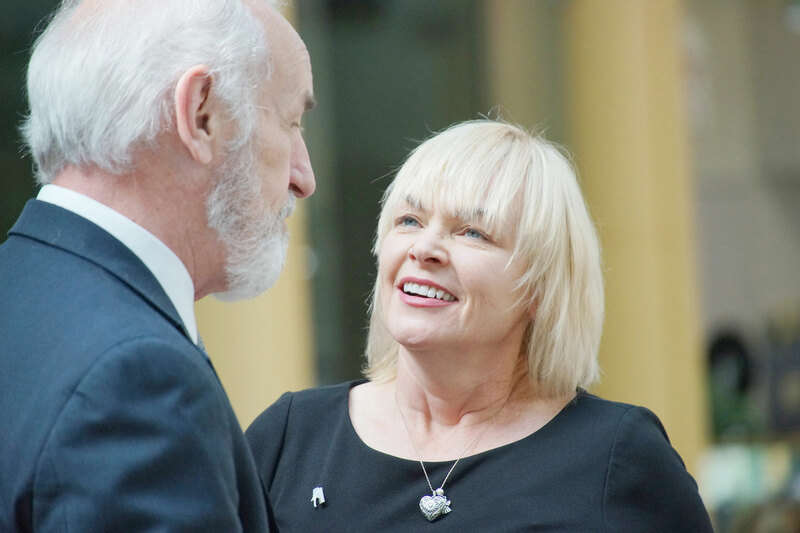 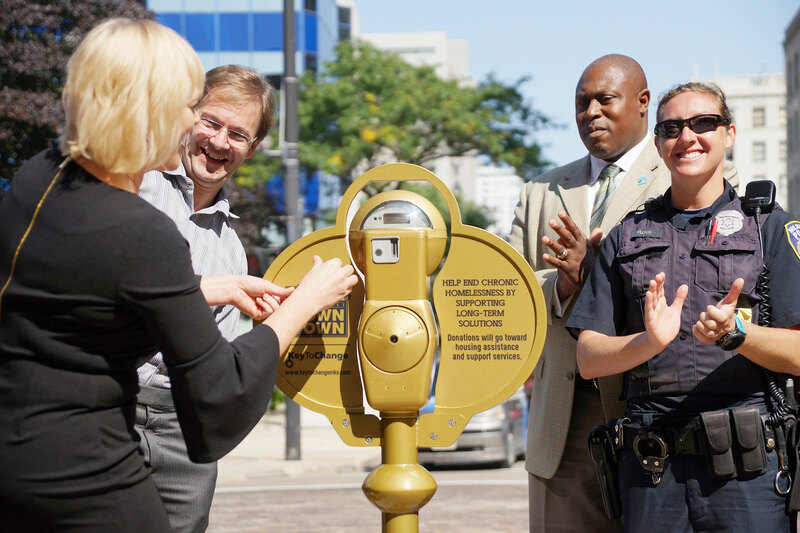 “Give people a place to feel safe. 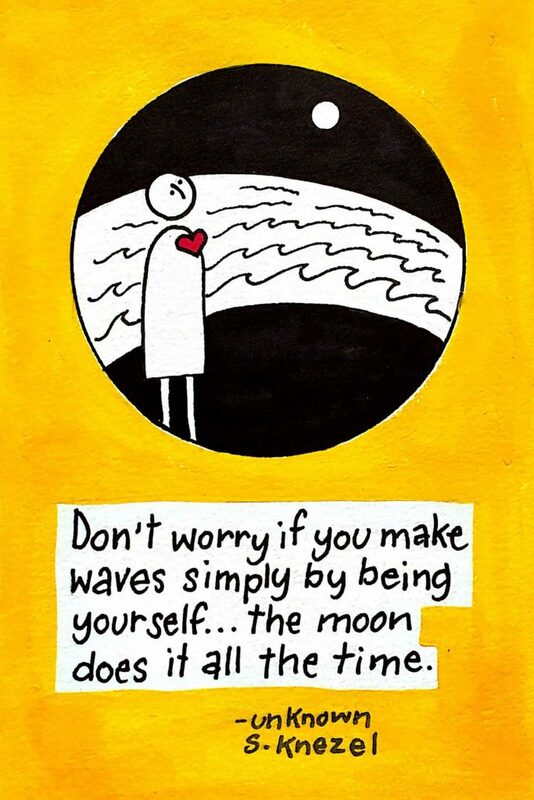 Everyone, not just some people. 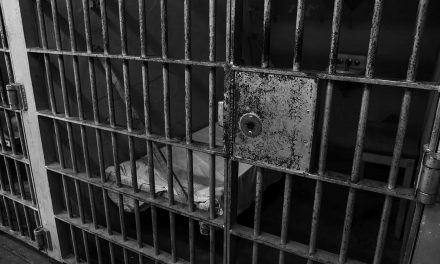 And then provide them with the wraparound services that they need for rehabilitation, for job training, for job placement. 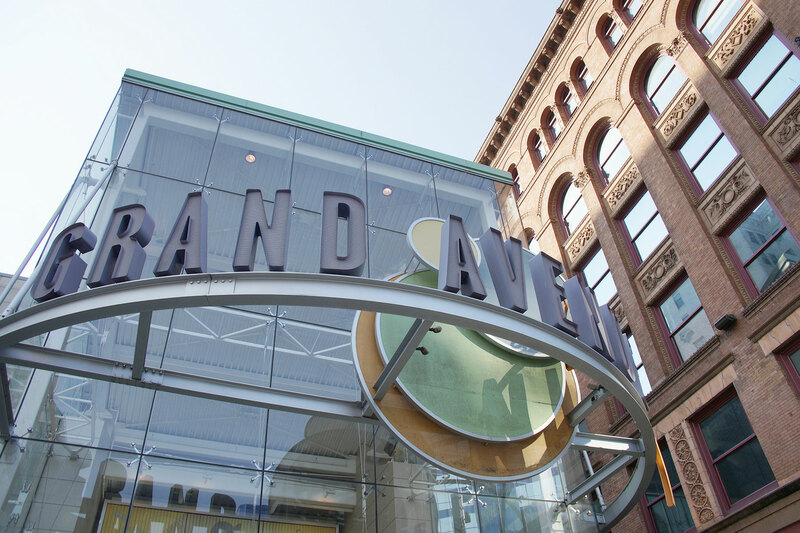 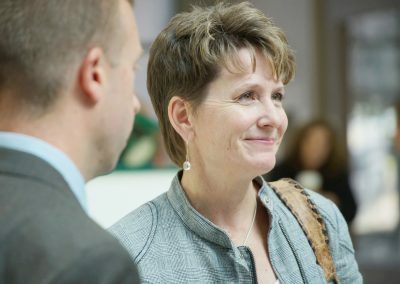 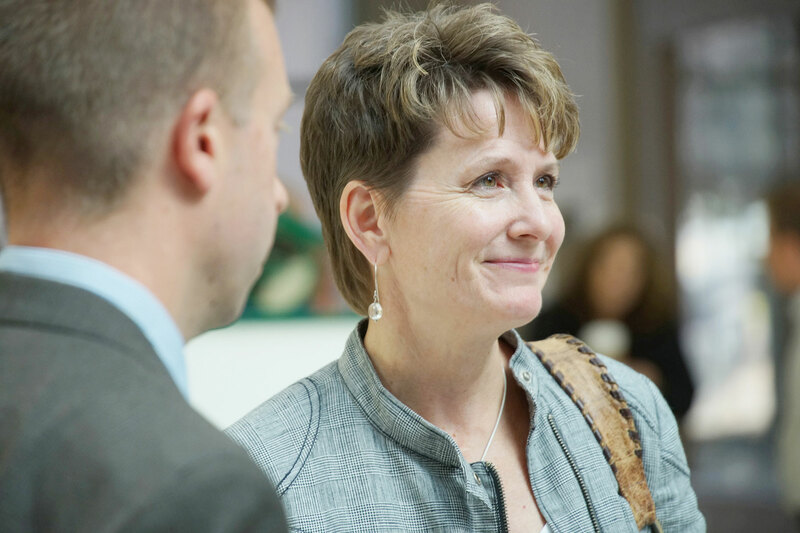 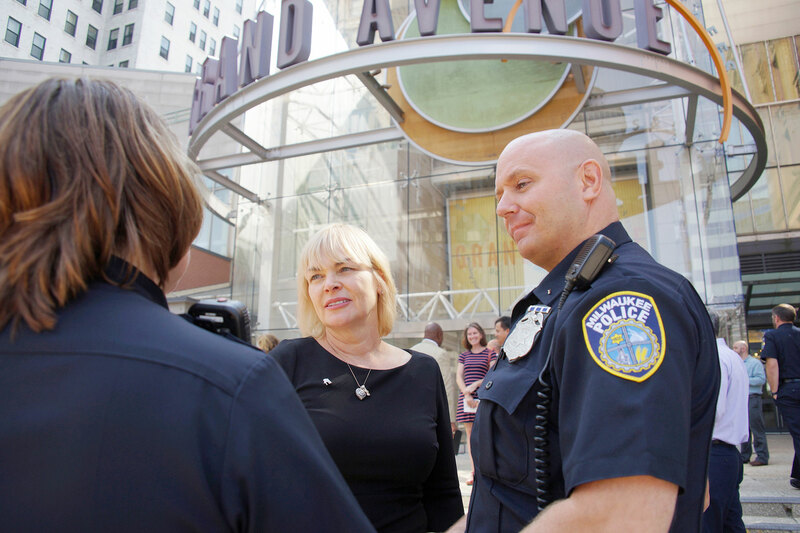 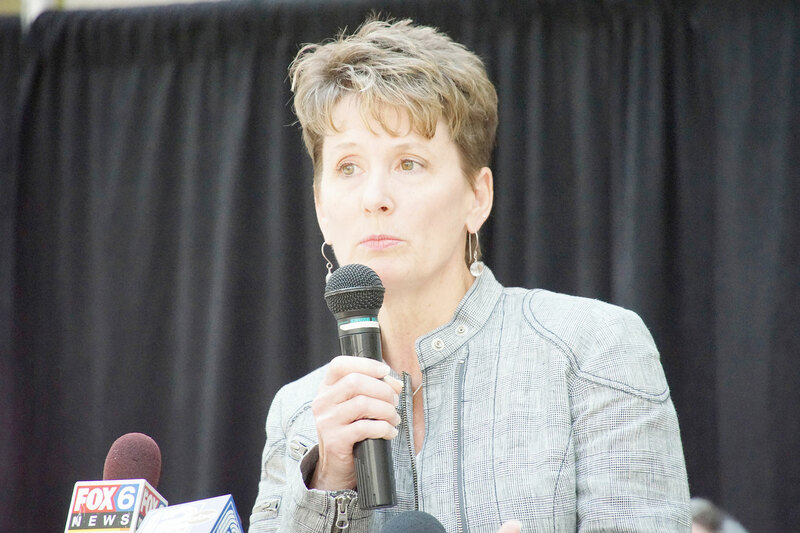 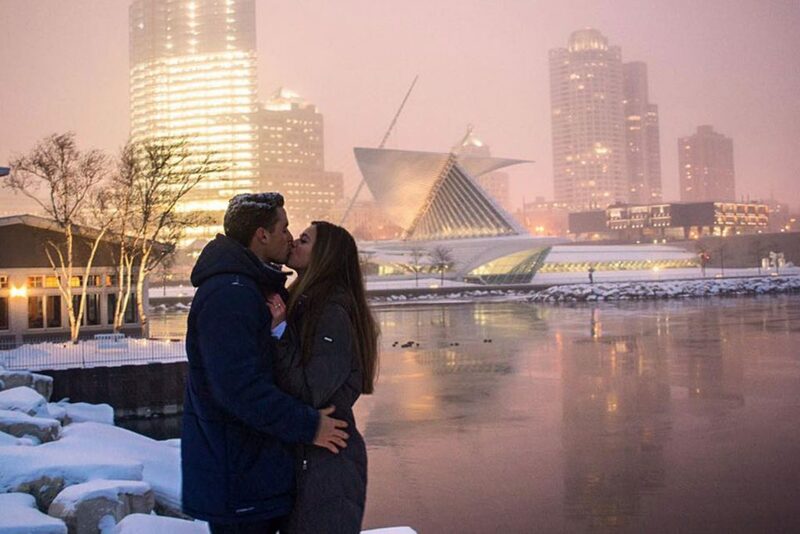 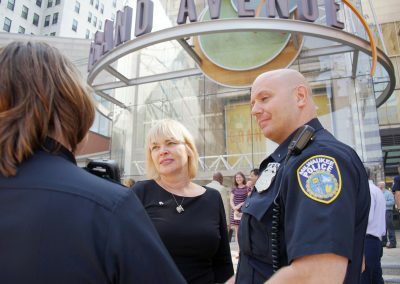 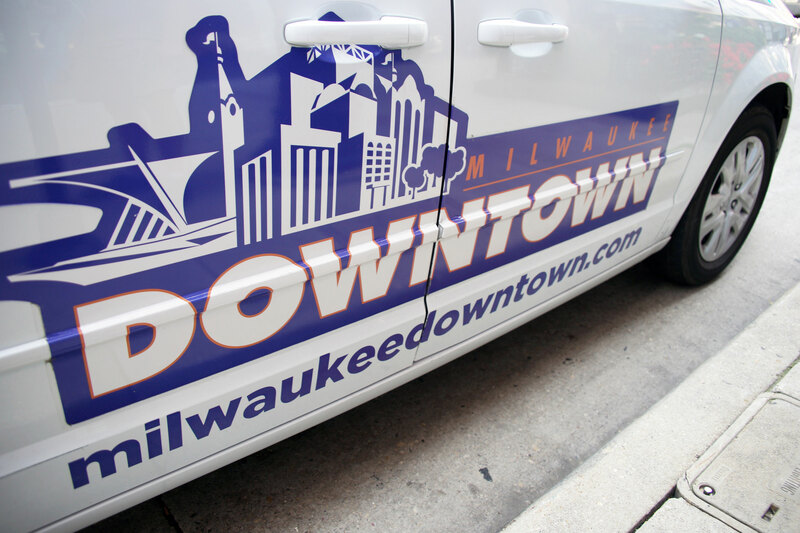 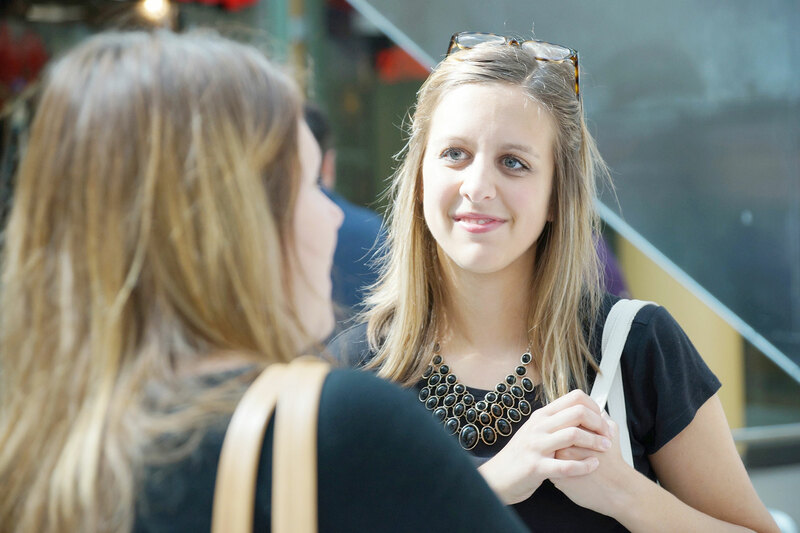 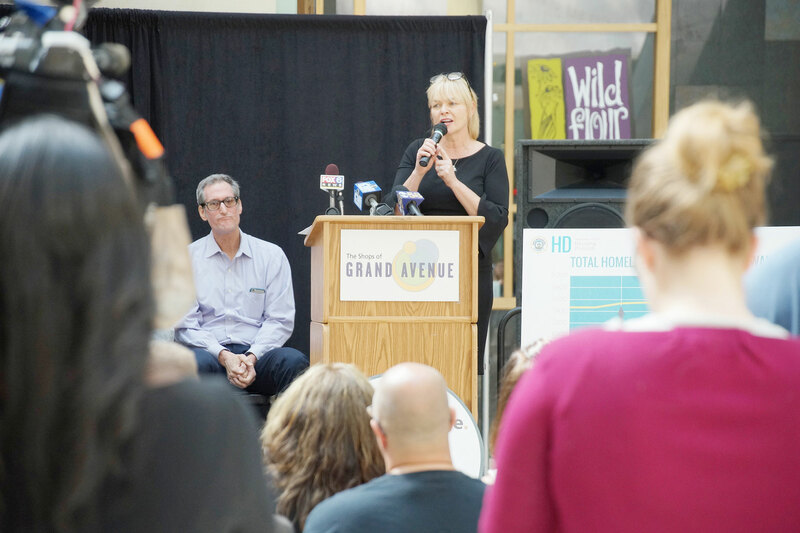 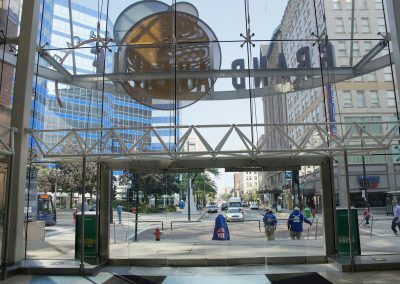 All the support they need to feel like they also have a place in this community.” – Beth Weirick, CEO of Milwaukee Downtown, BID #21. 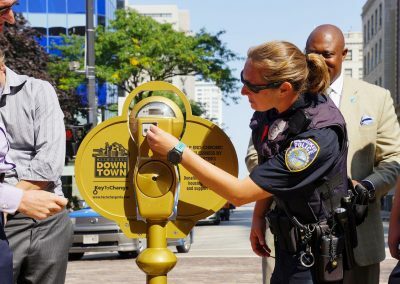 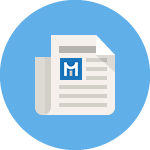 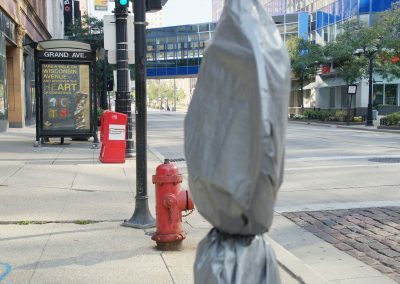 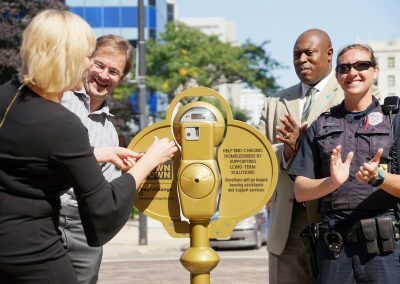 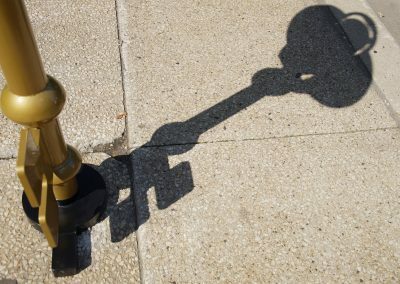 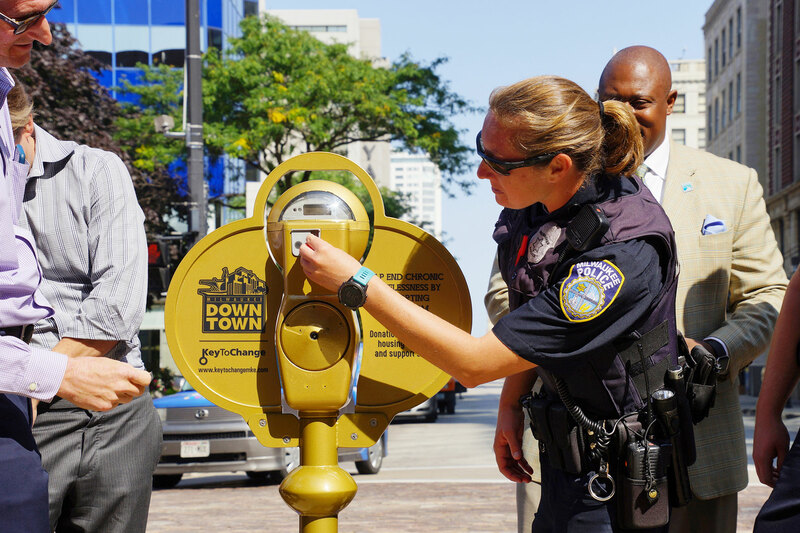 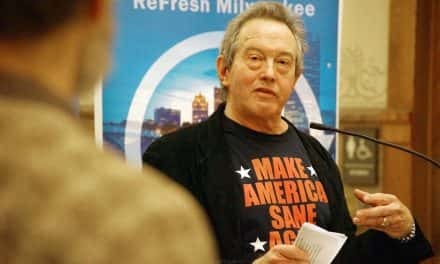 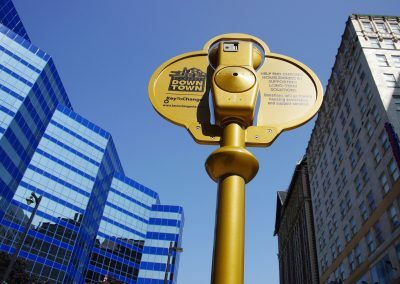 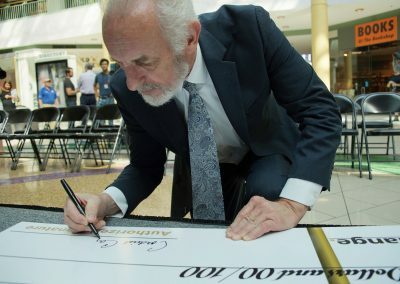 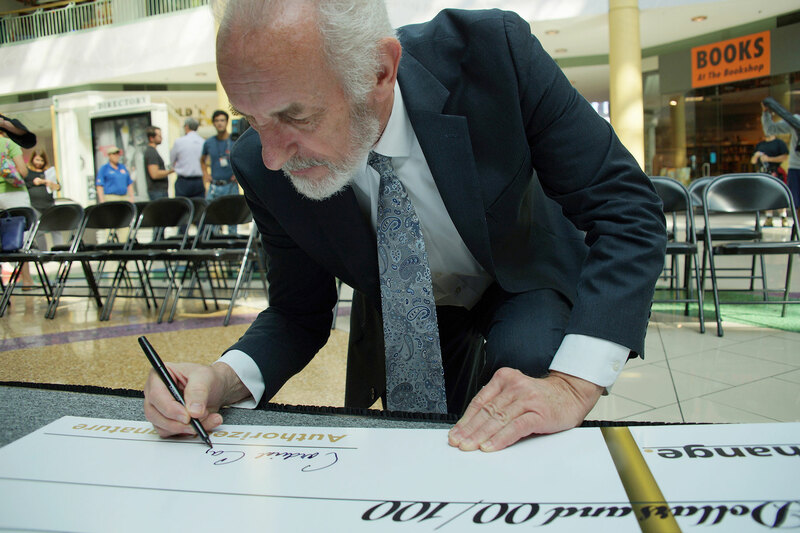 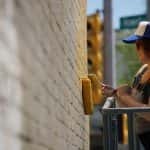 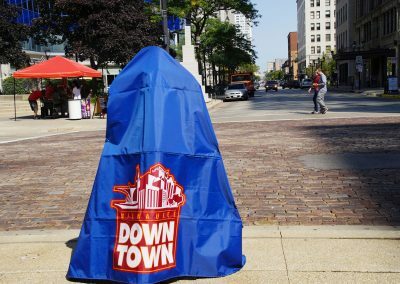 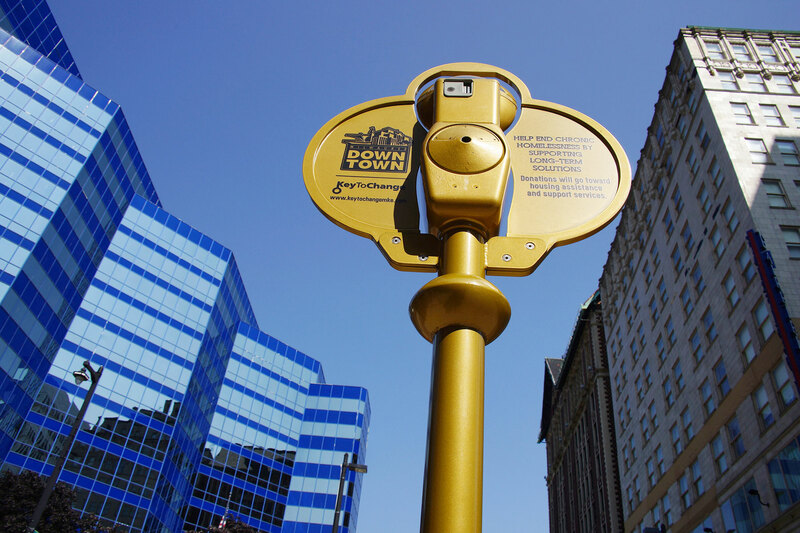 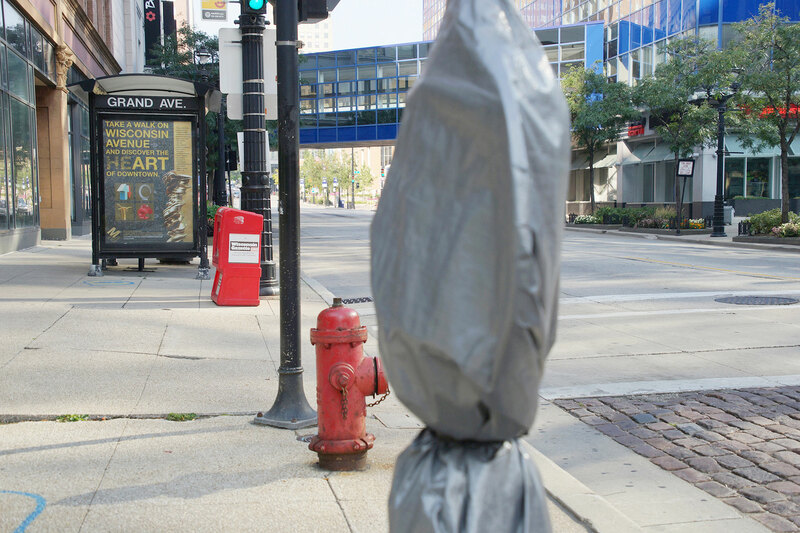 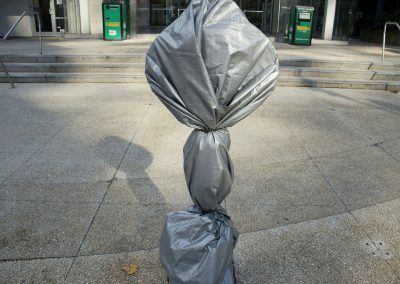 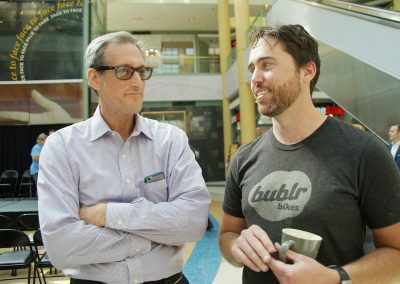 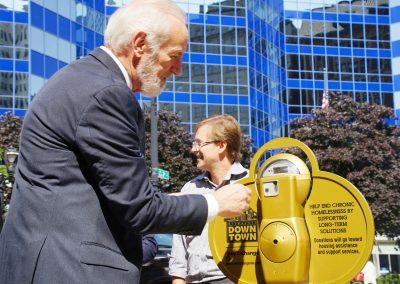 In cities across the country, parking meters have been repurposed to end chronic homelessness, and on September 13 Milwaukee joined that effort, to implement a community-giving program through meter donations. 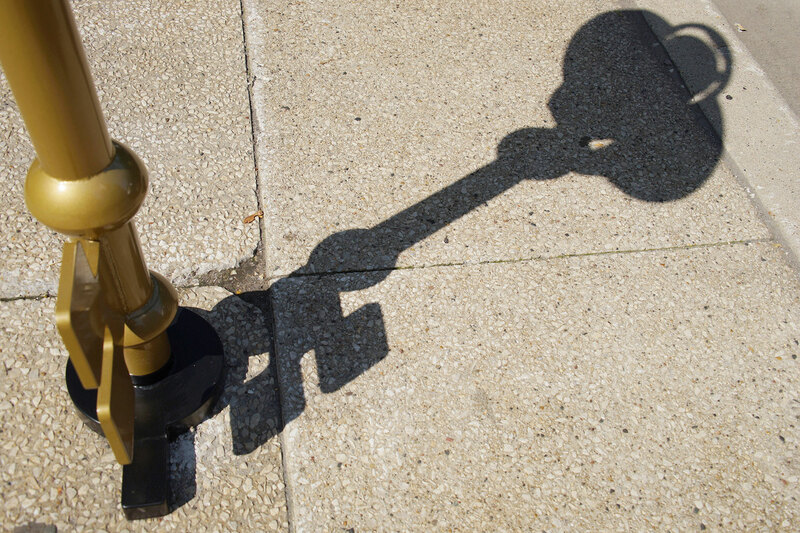 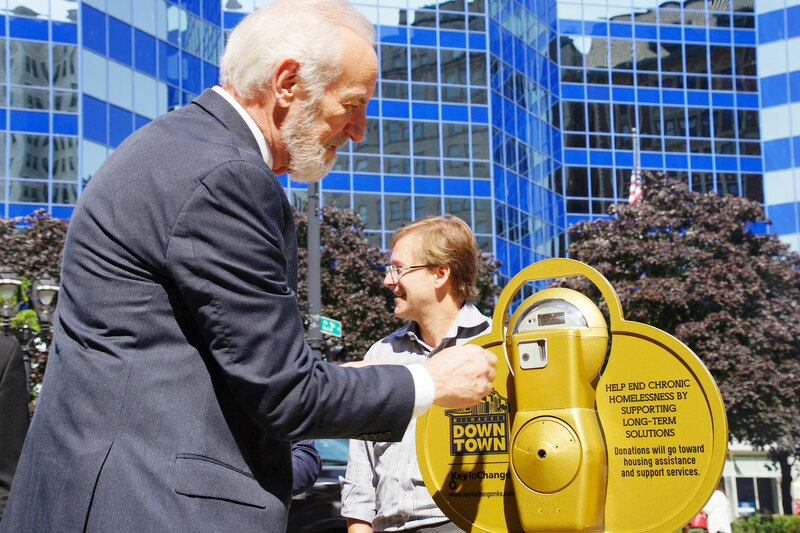 Key to Change includes seven coin parking meters along Wisconsin Avenue. 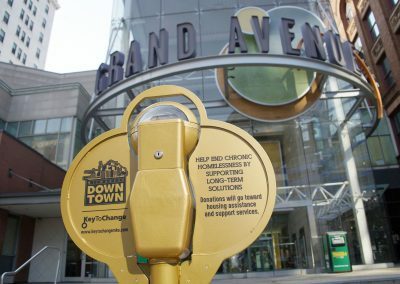 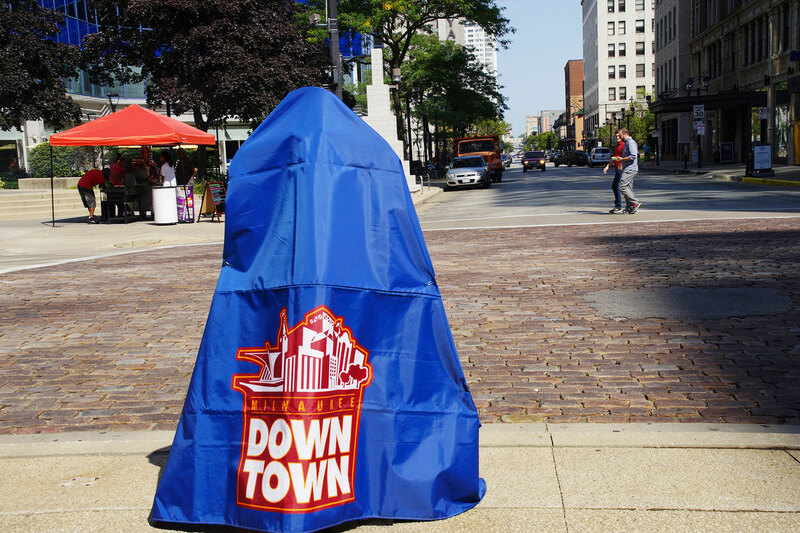 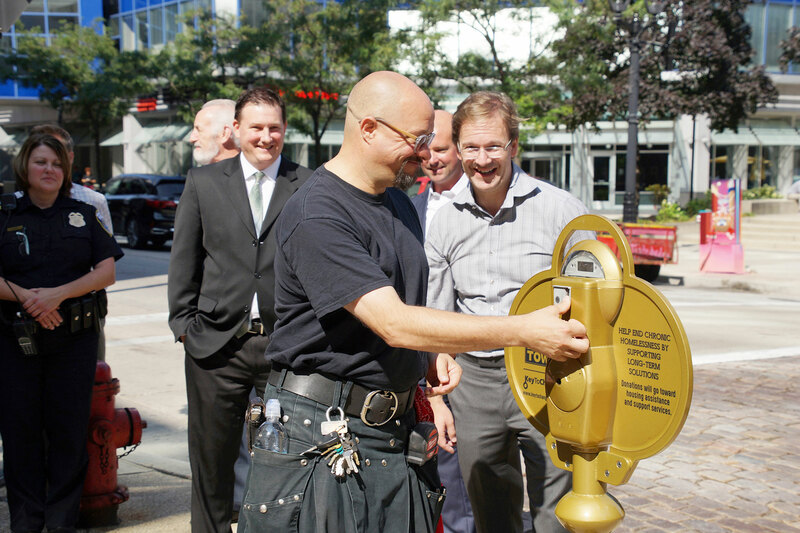 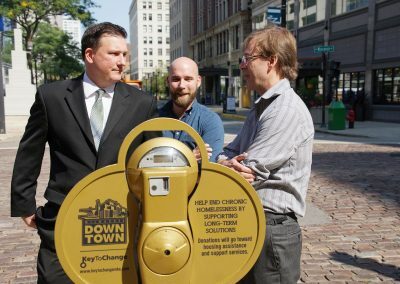 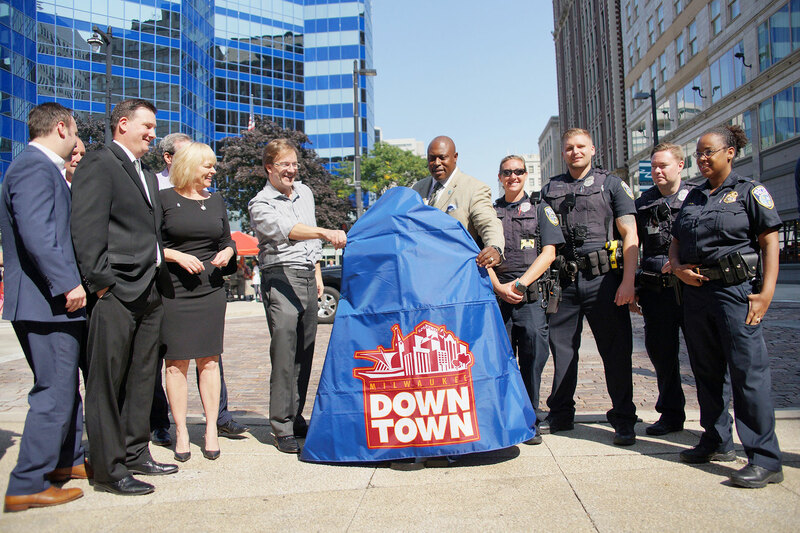 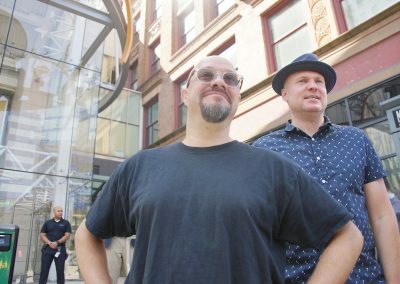 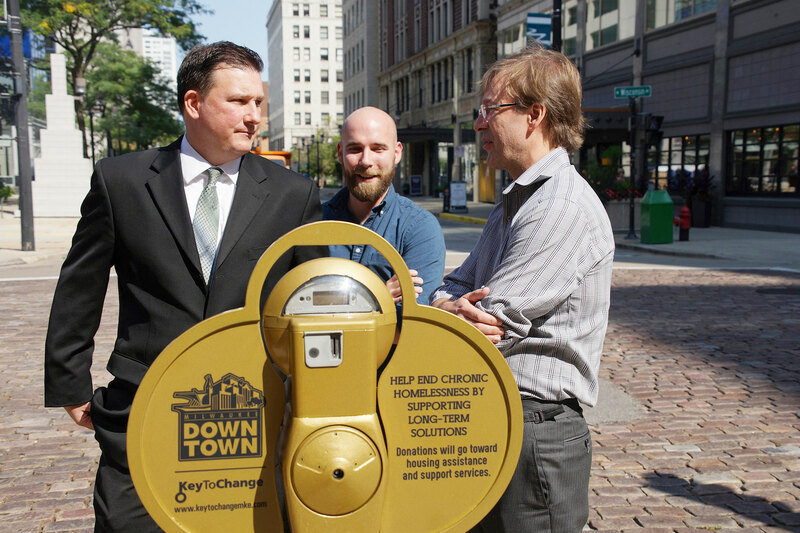 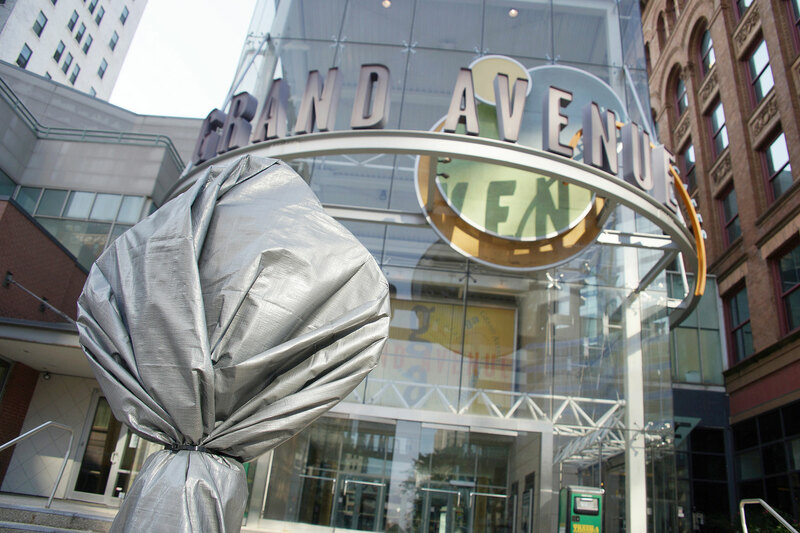 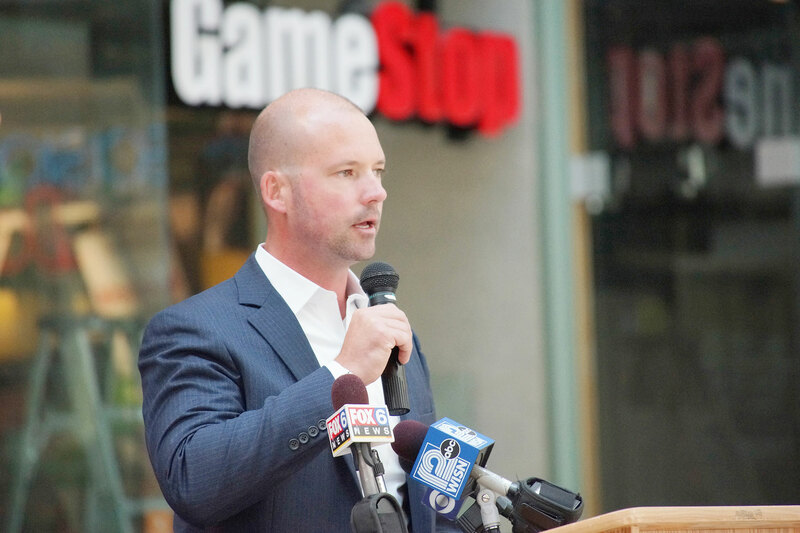 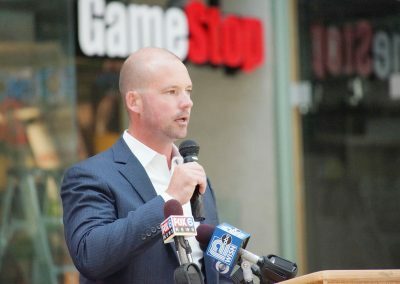 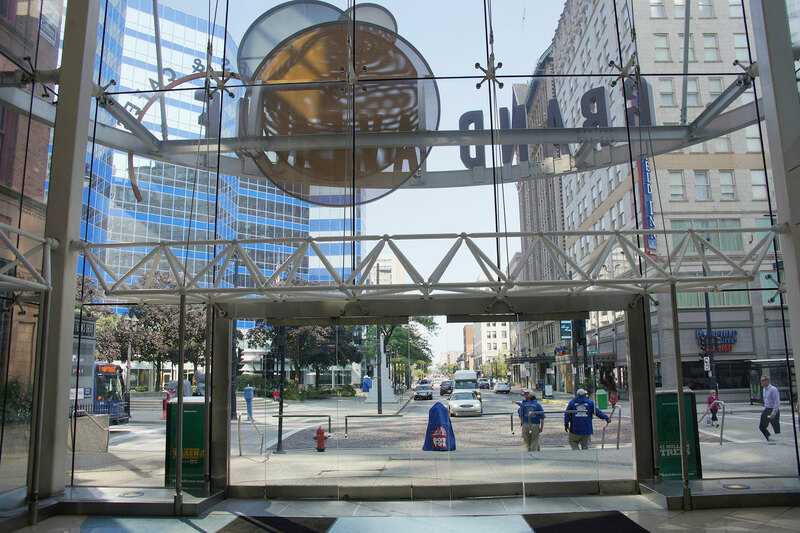 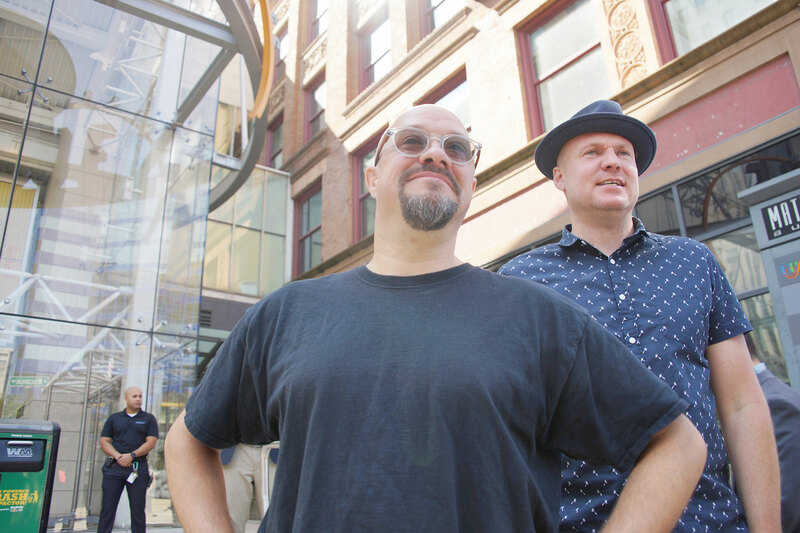 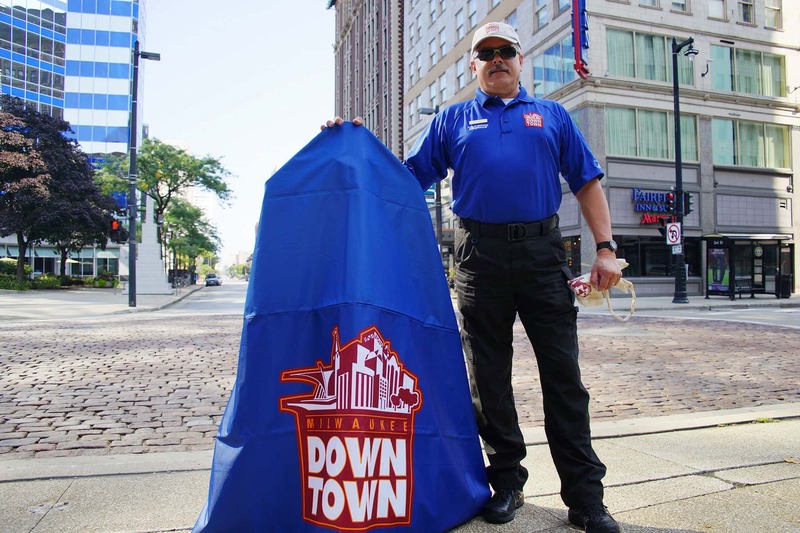 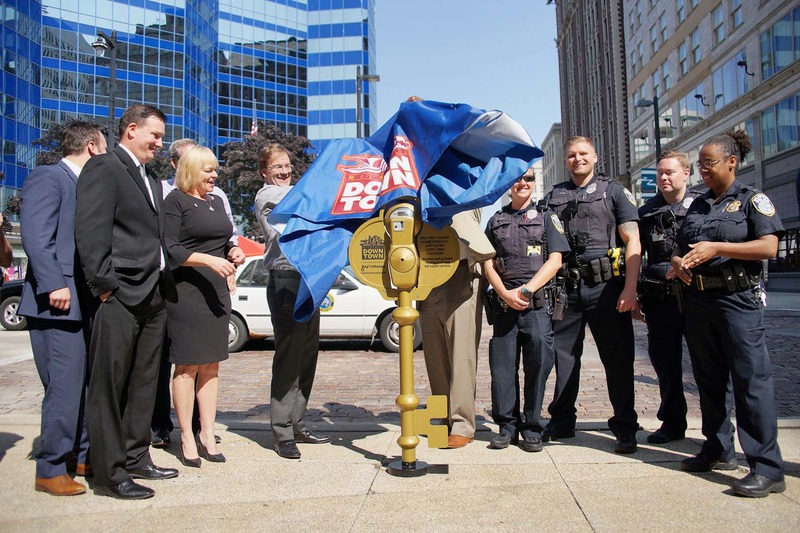 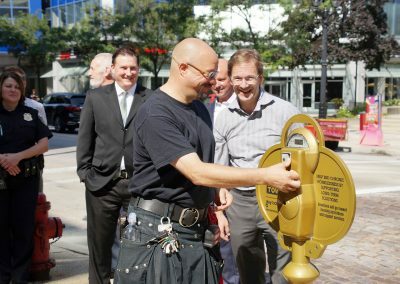 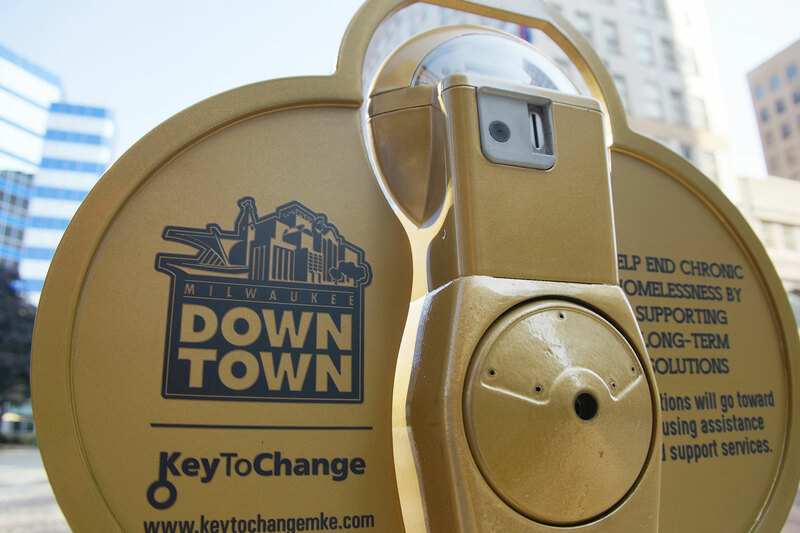 Led by Milwaukee Downtown, BID #21 and retrofitted by Flux Design, the key-shaped meters were unveiled to the public. 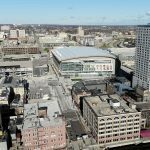 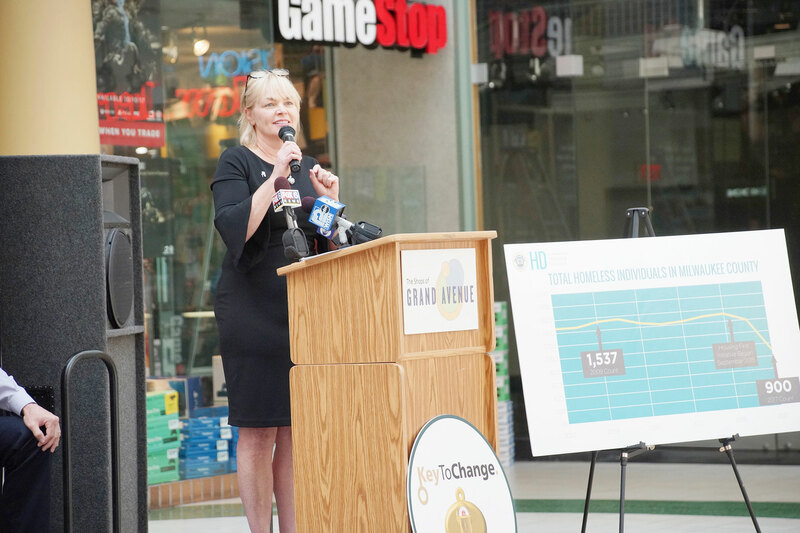 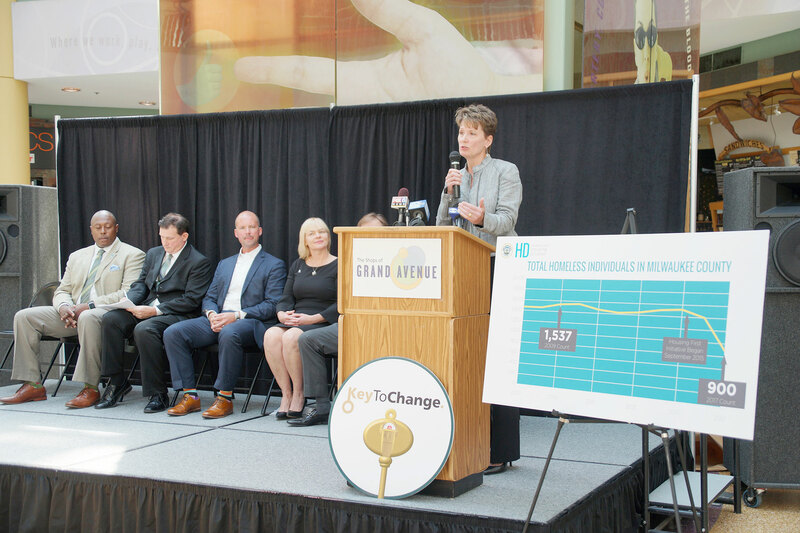 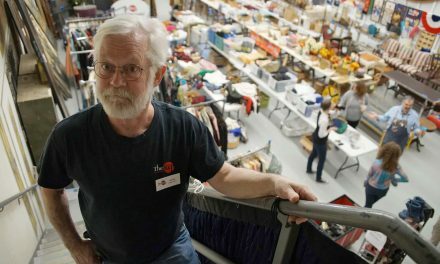 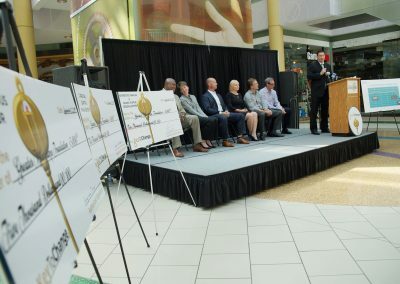 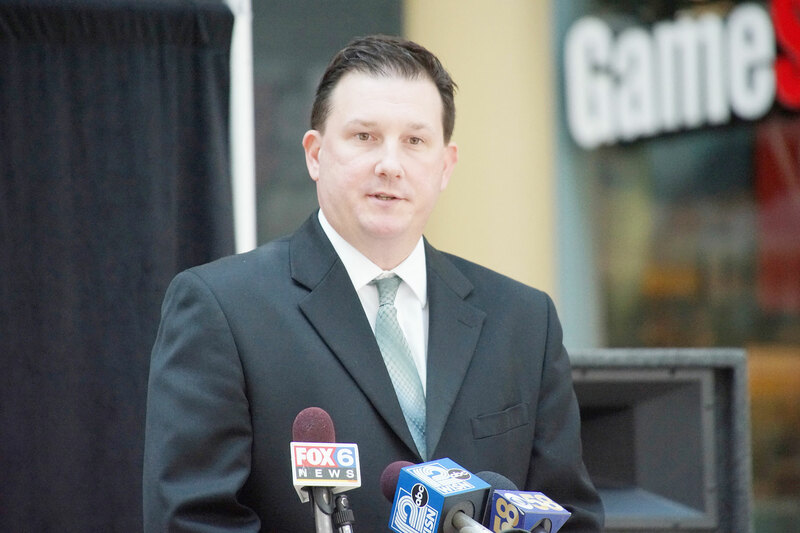 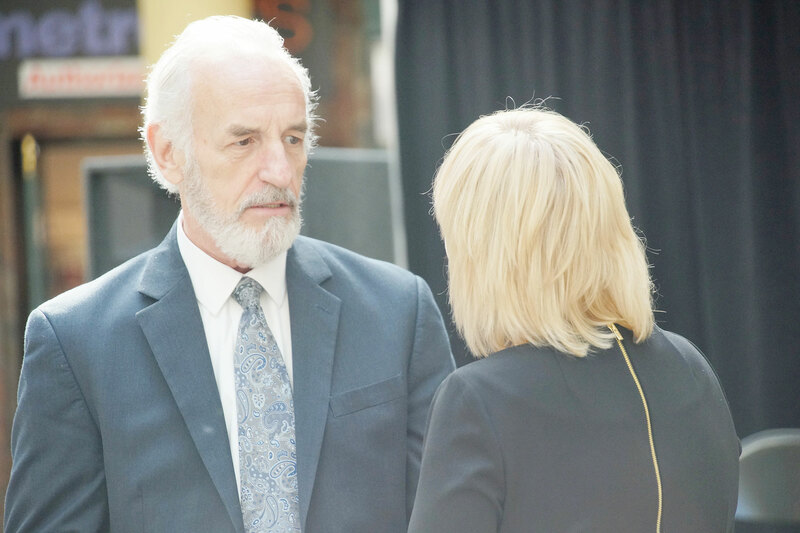 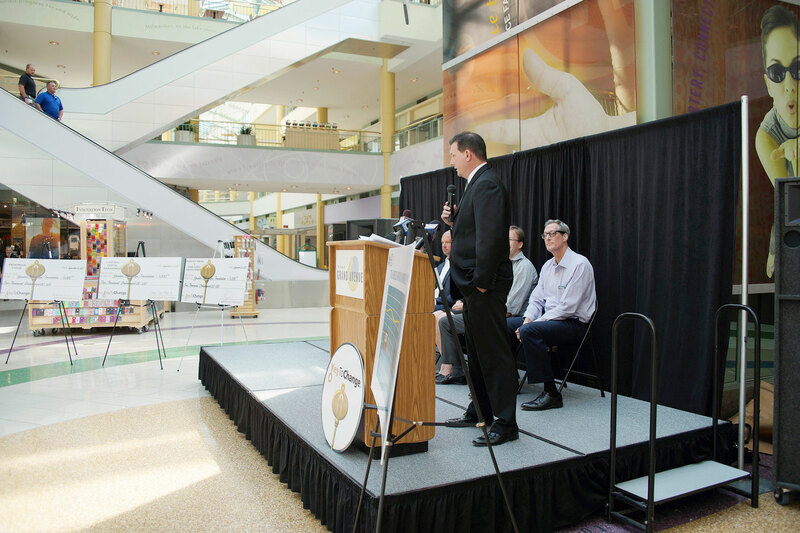 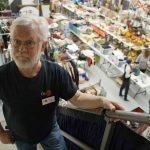 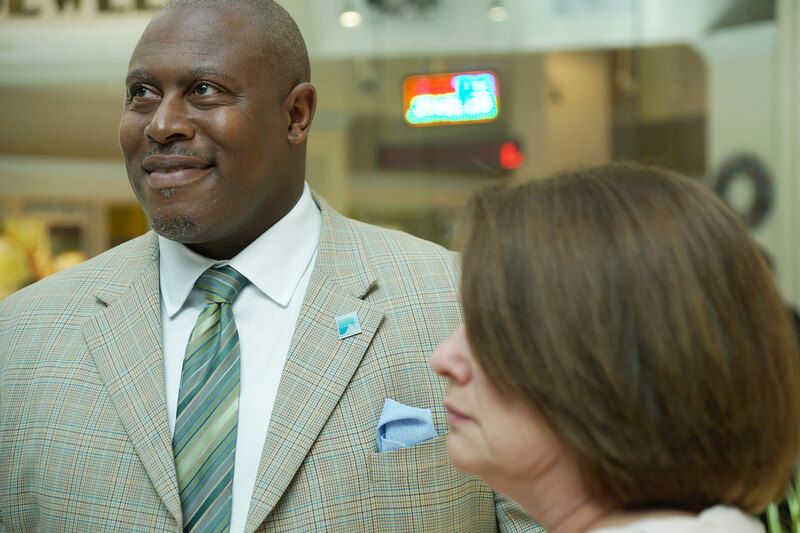 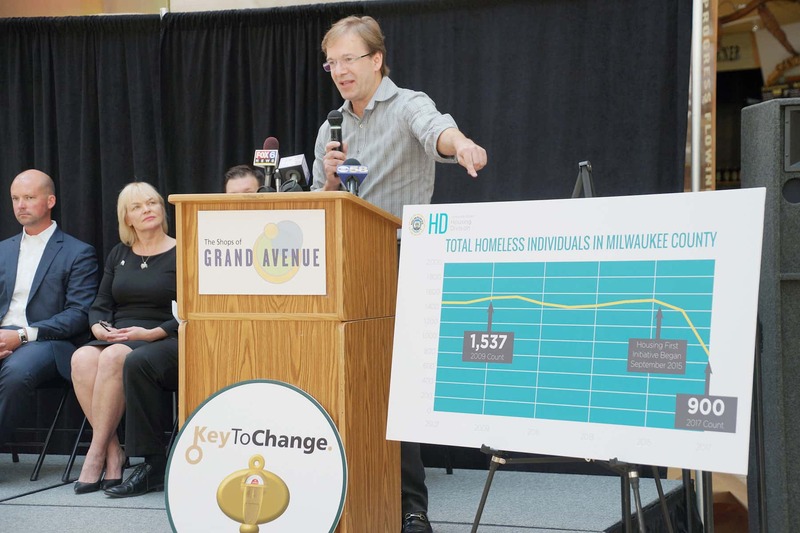 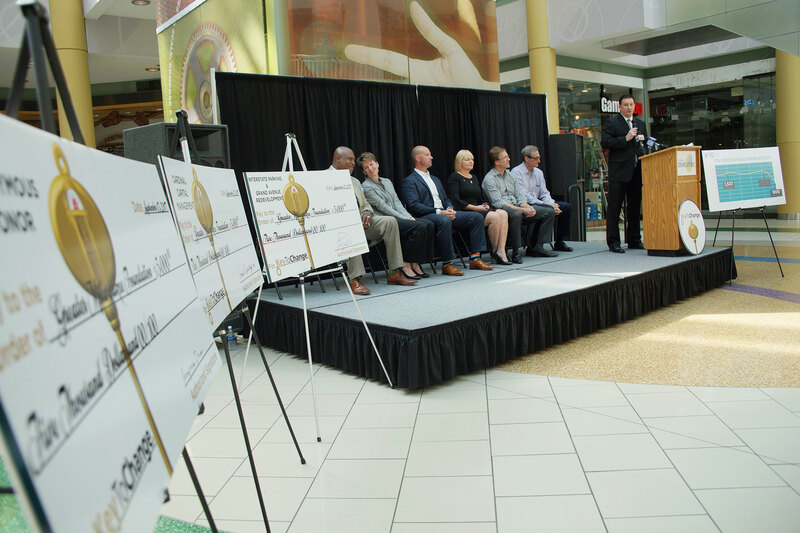 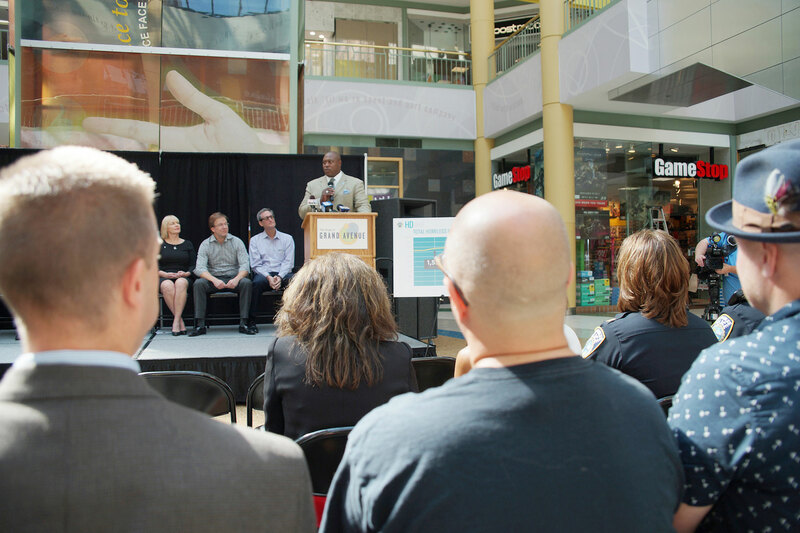 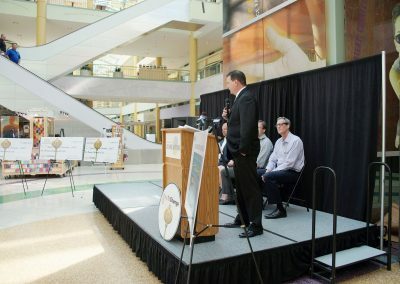 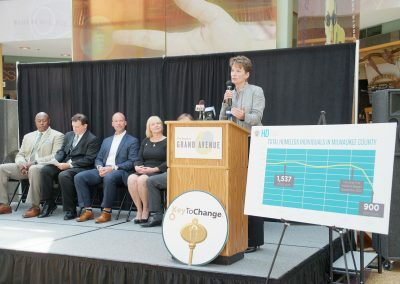 Donations from the Key to Change initiative will be collected by Milwaukee Downtown, BID #21 and used to further the mission of Milwaukee County Housing Division’s Housing First project, an initiative that recognizes housing as the first step toward stabilization. 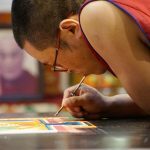 Stable living conditions are then complemented by services, which range from rehabilitation and counseling to job training and placement. 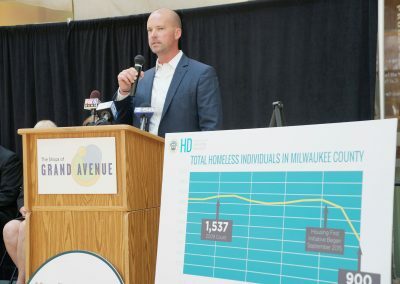 The initiative also includes a Downtown homeless outreach coordinator. 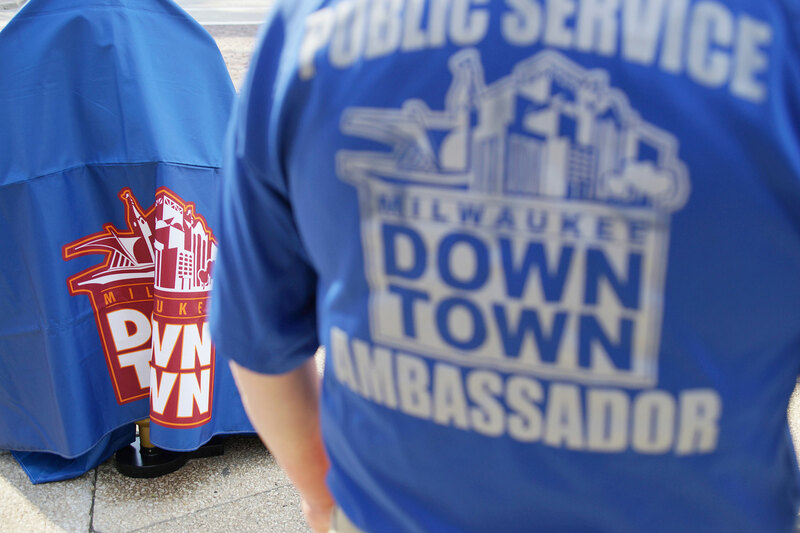 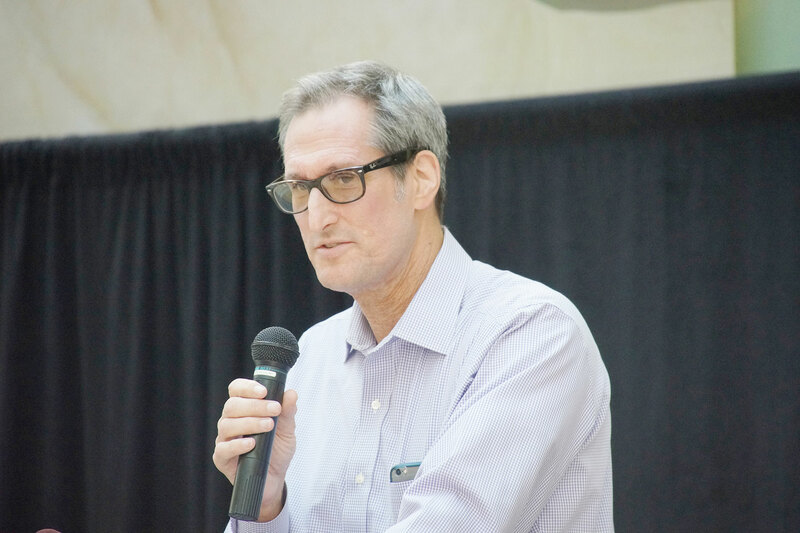 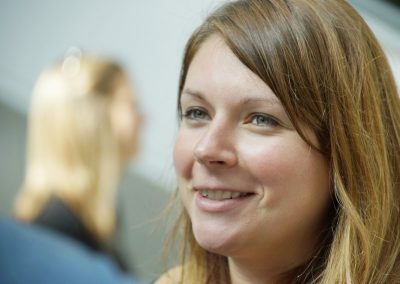 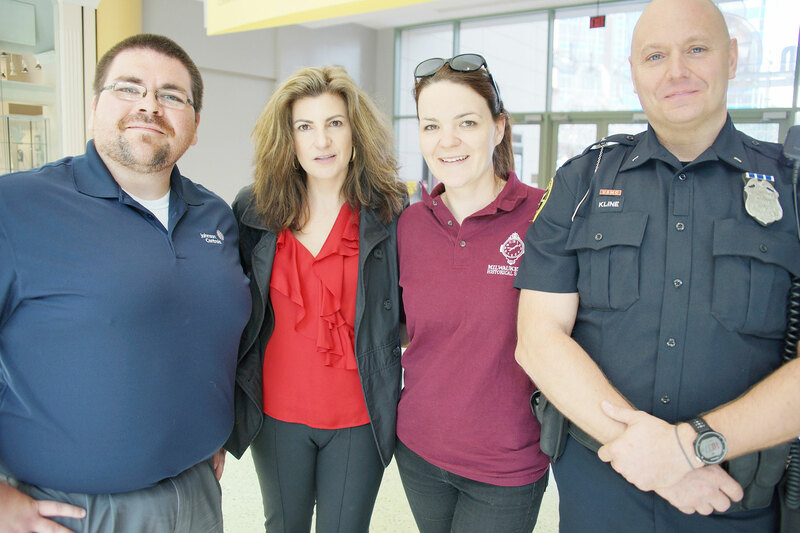 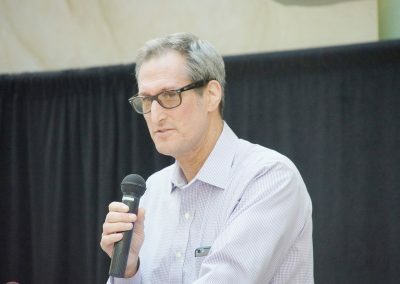 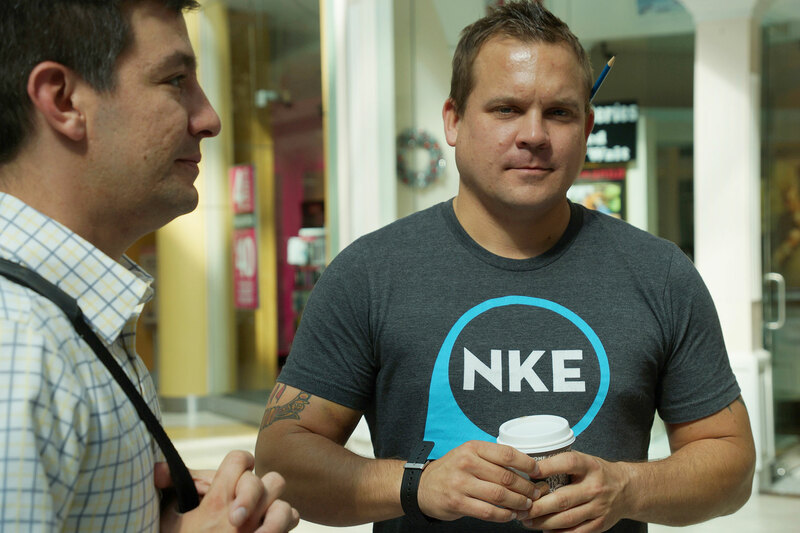 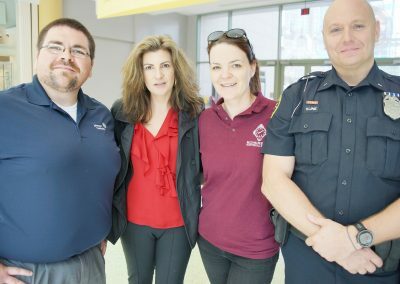 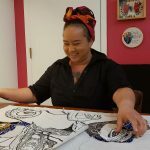 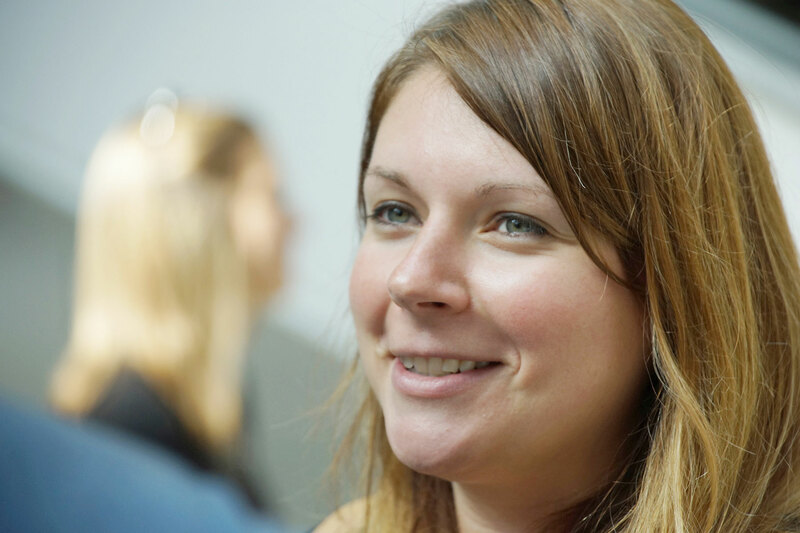 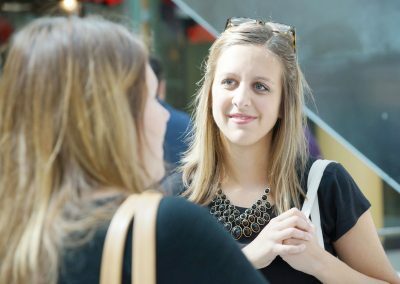 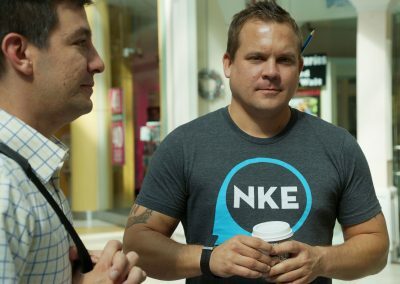 With a consistent presence downtown and access to an outreach vehicle, this full-time staff person works on the front lines helping individuals get off the streets, and is a point person for other homeless-related issues. 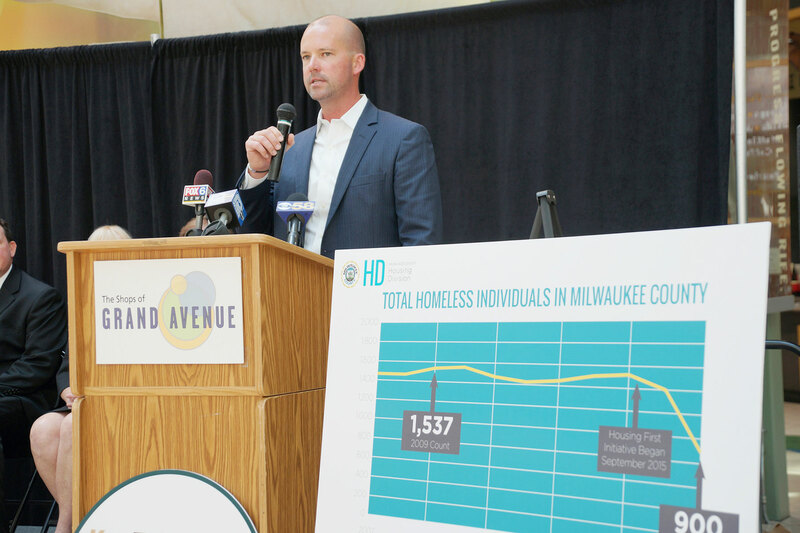 “Milwaukee is going to end chronic homelessness faster than any municipality of our size in the nation. 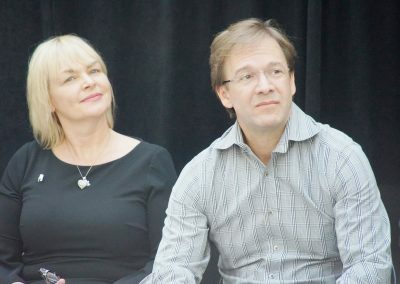 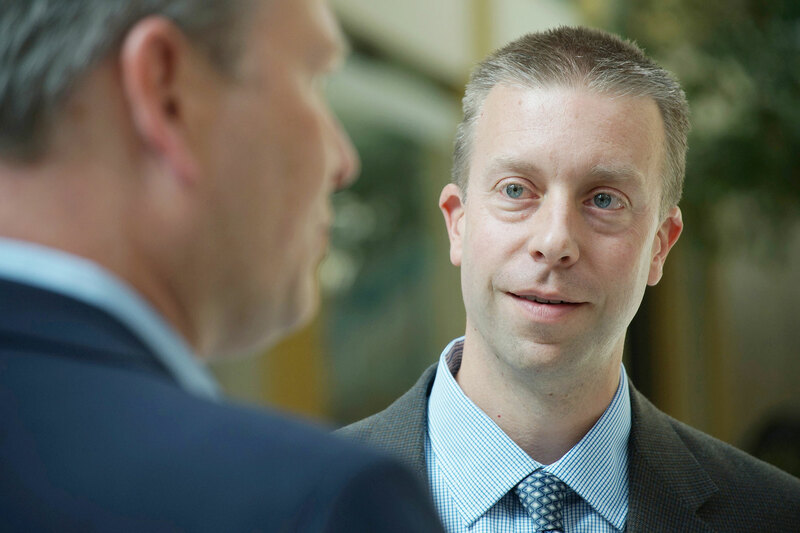 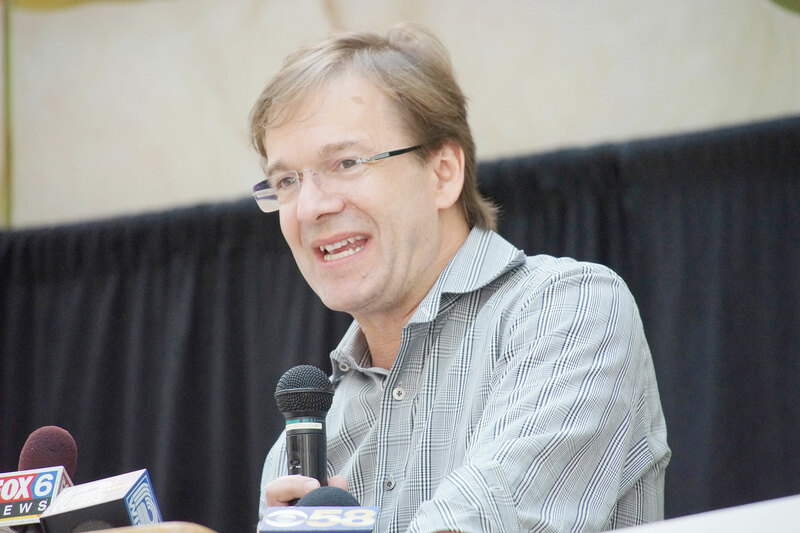 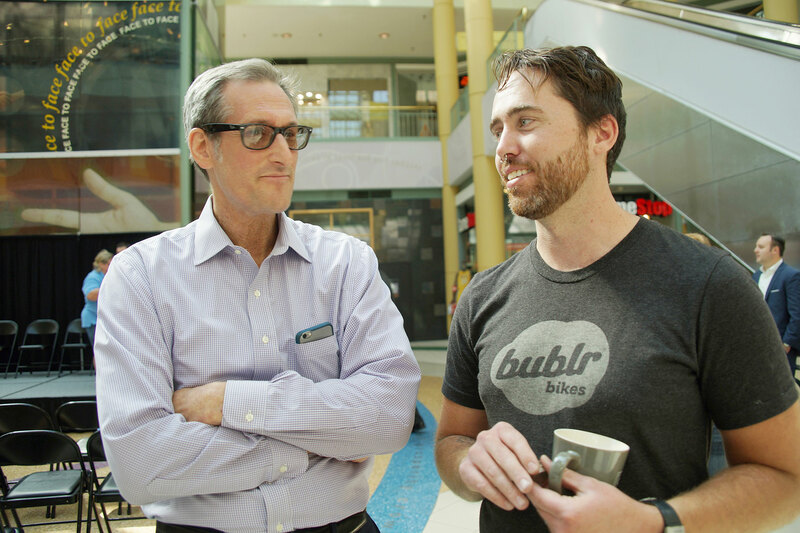 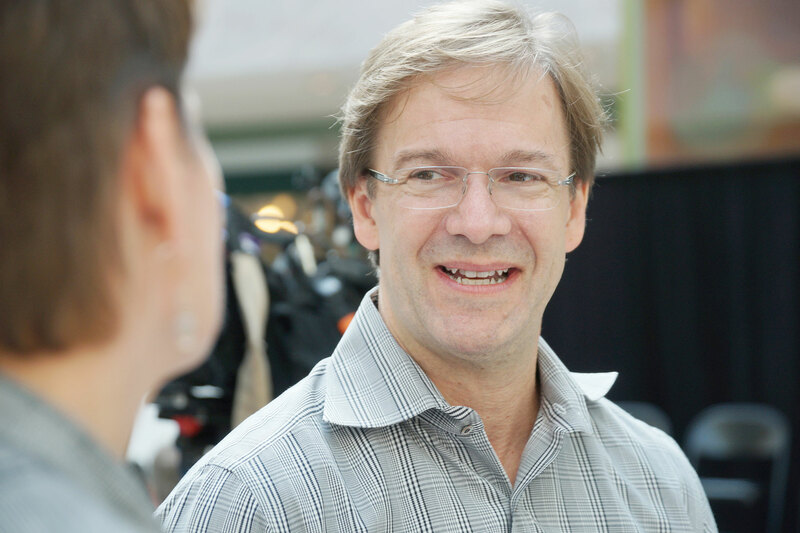 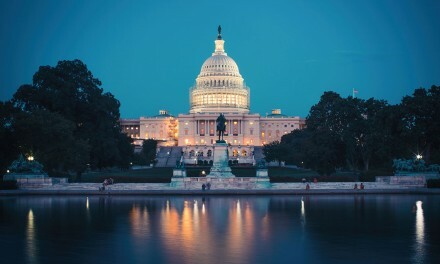 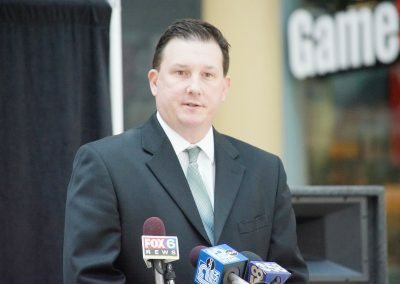 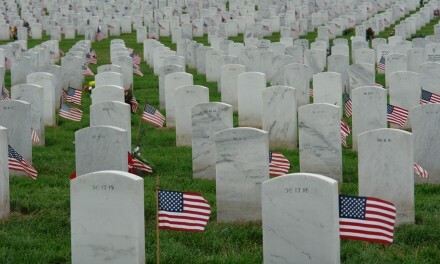 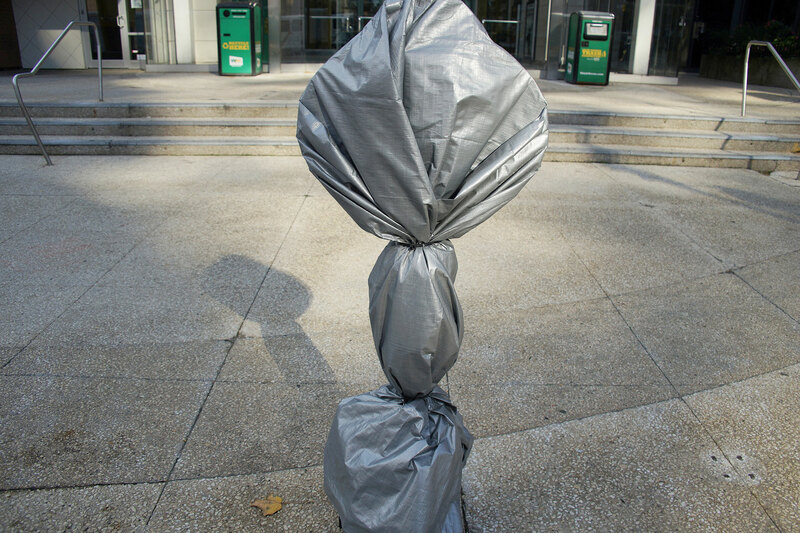 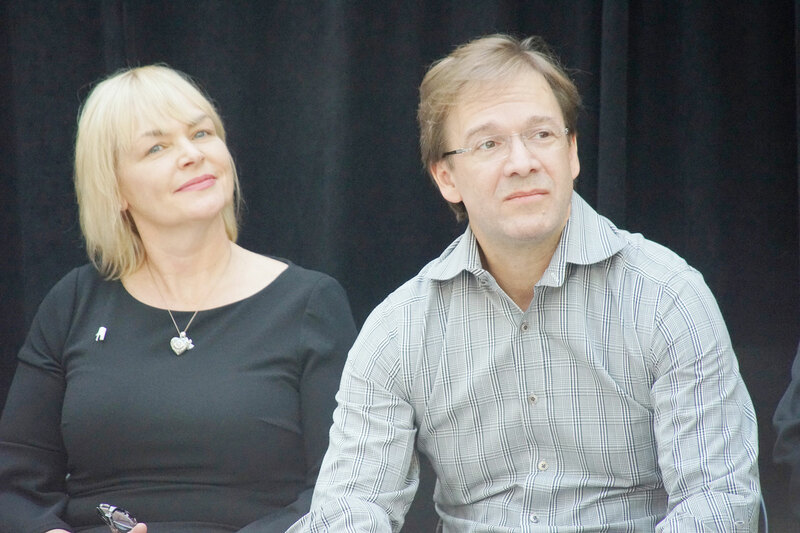 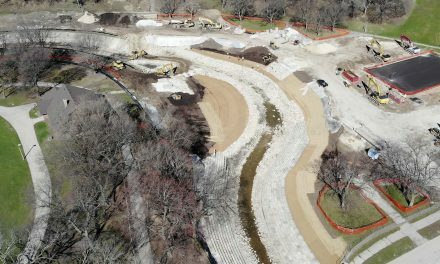 That is something to be proud of,” said Chris Abele, Milwaukee County Executive. 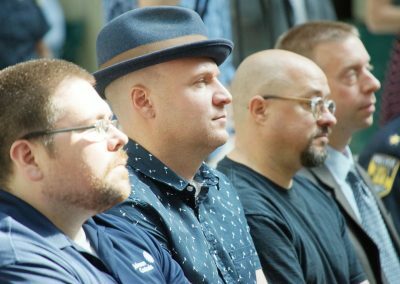 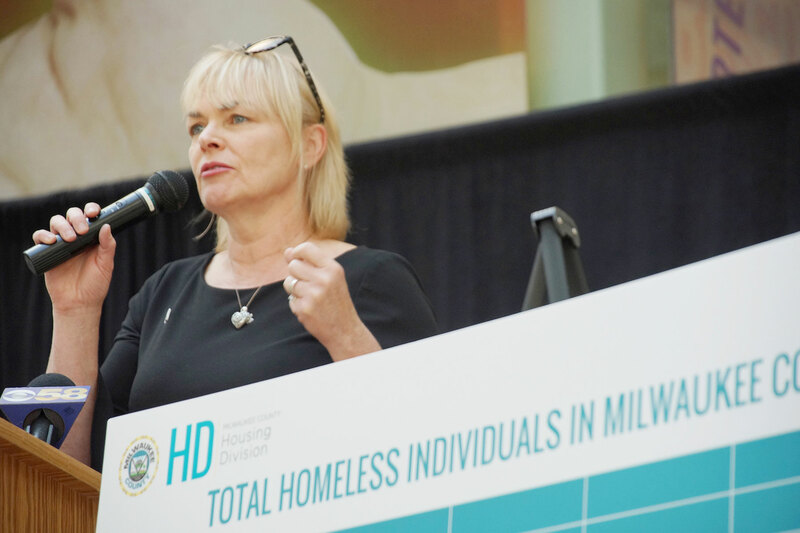 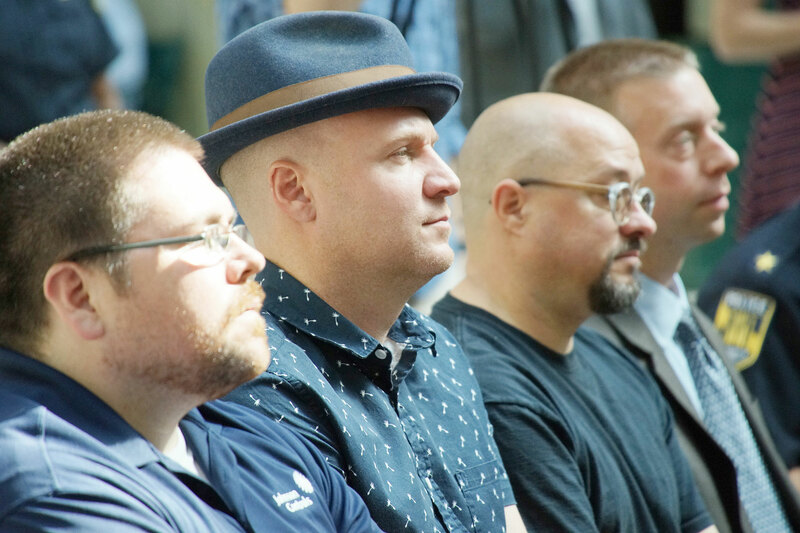 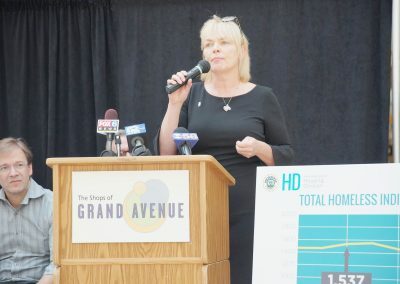 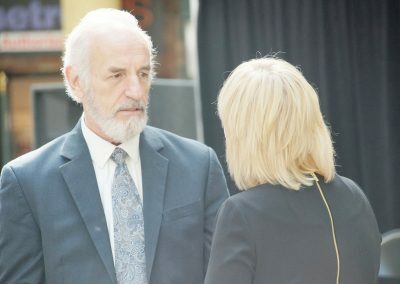 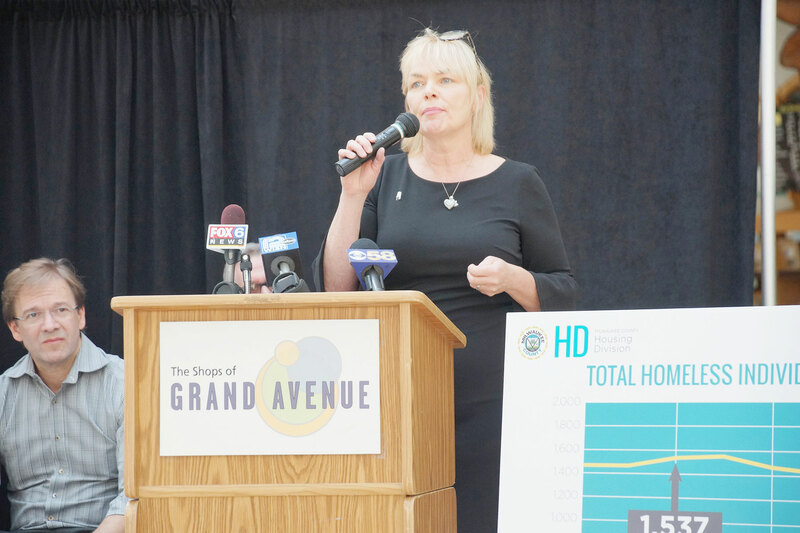 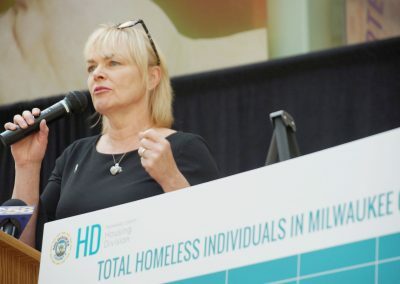 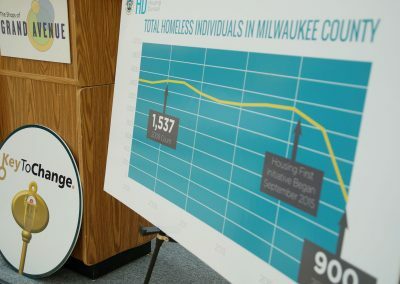 Since launching its Housing First initiative in September 2015, Milwaukee County Housing Division has placed more than 225 chronically homeless individuals into permanent supportive housing. 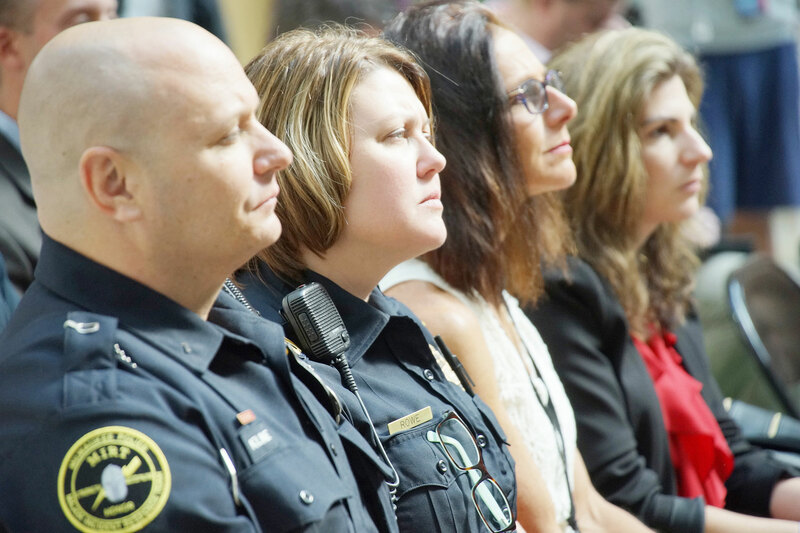 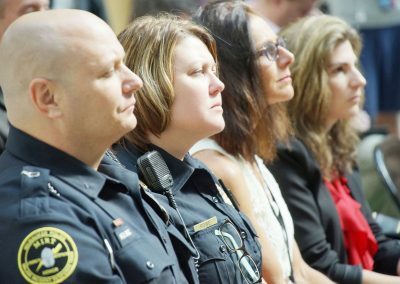 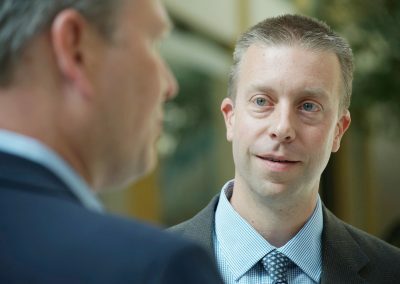 Approaching the two-year mark, the program has maintained a 98 percent retention rate. 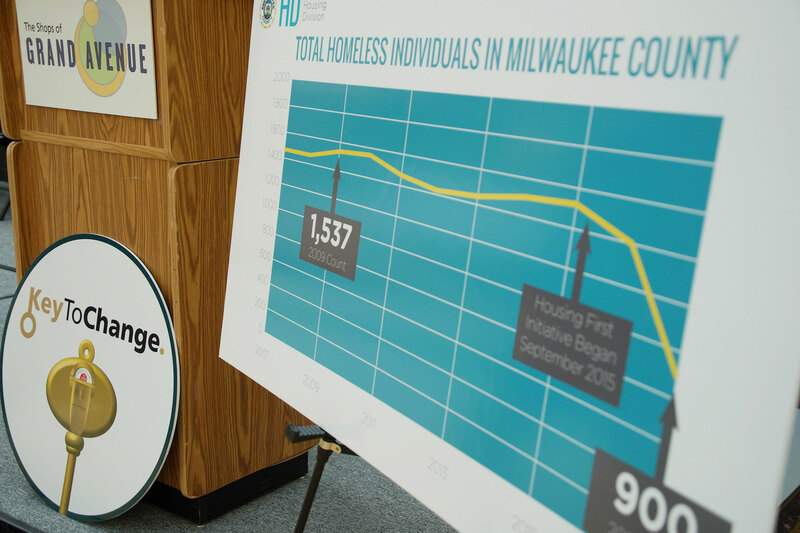 Meanwhile, national models indicate an 84 percent retention rate. 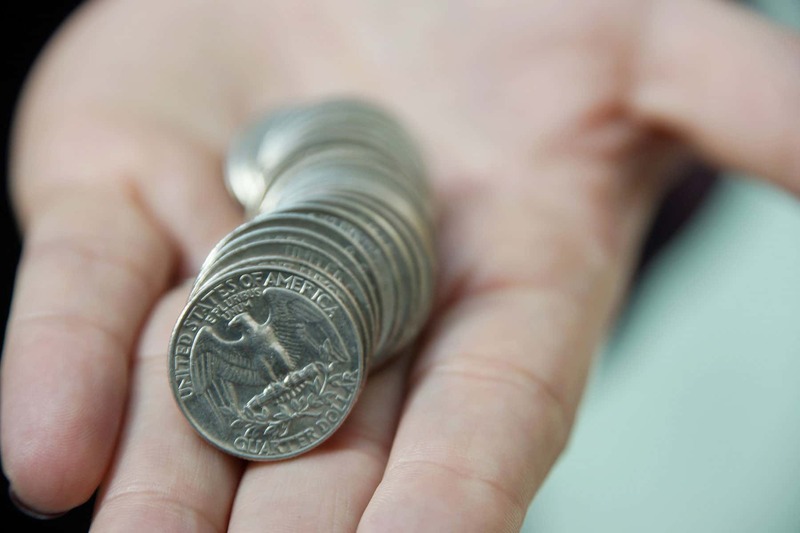 While many people are truly in need, giving spare change to a panhandler is only a short-term solution to a deeper problem. 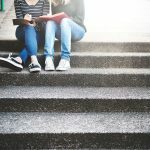 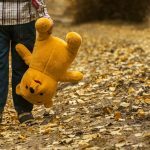 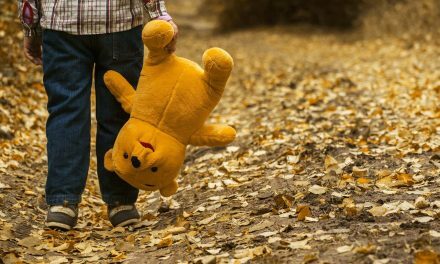 The kindness may only reinforce negative behavior when more meaningful assistance is needed and available. Donations to Key to Change can be made through coin deposits at any of the seven meter locations listed below. 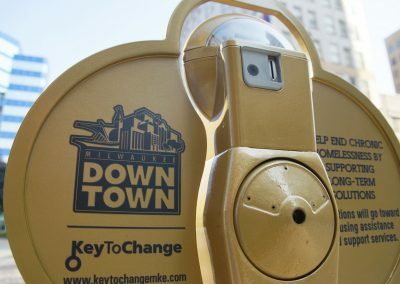 Online transactions can also be made at www.keytochangemke.com. 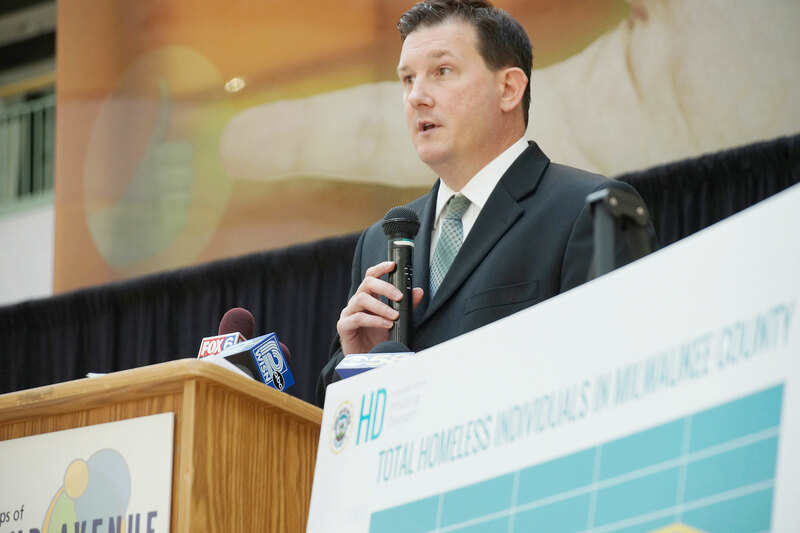 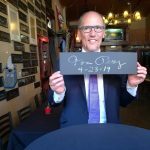 Online donors will receive a tax-deductible receipt and be able to allocate their dollars to one of three programs – funding for a Downtown Homeless Outreach Coordinator, support of the Housing First Endowment Fund or move-in kits for Housing First participants. 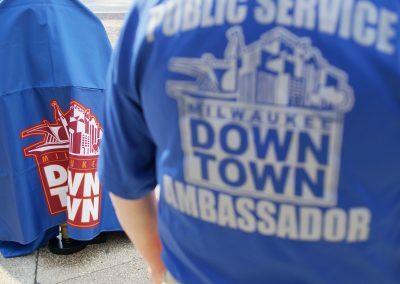 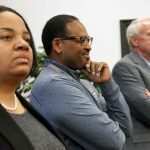 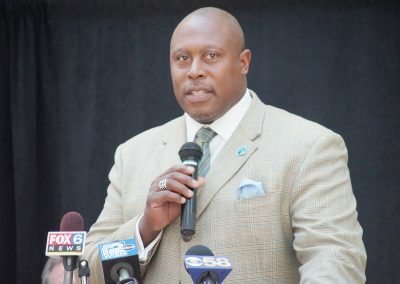 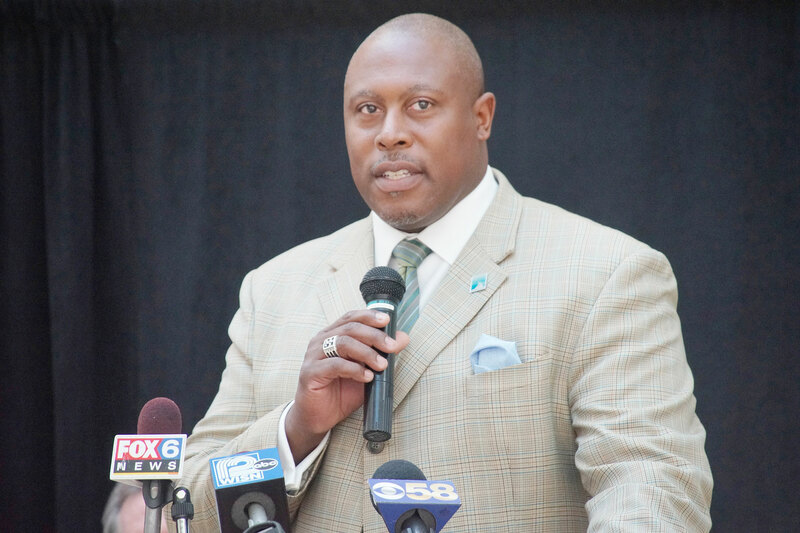 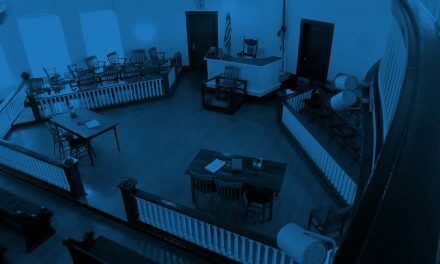 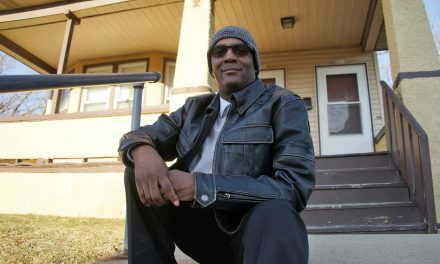 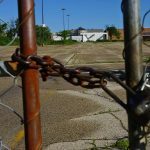 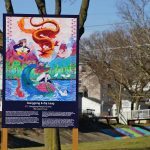 Key to Change is a partnership among the Milwaukee County Housing Division, City of Milwaukee, Marquette University, Milwaukee Police Department, City of Milwaukee – Office of the City Attorney, Milwaukee County District Attorney’s Office, East Town Association, Westown Association and Historic Third Ward Association. 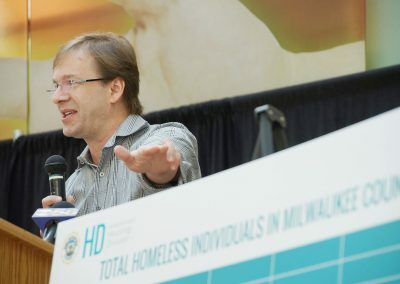 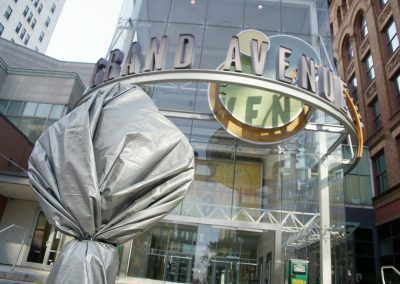 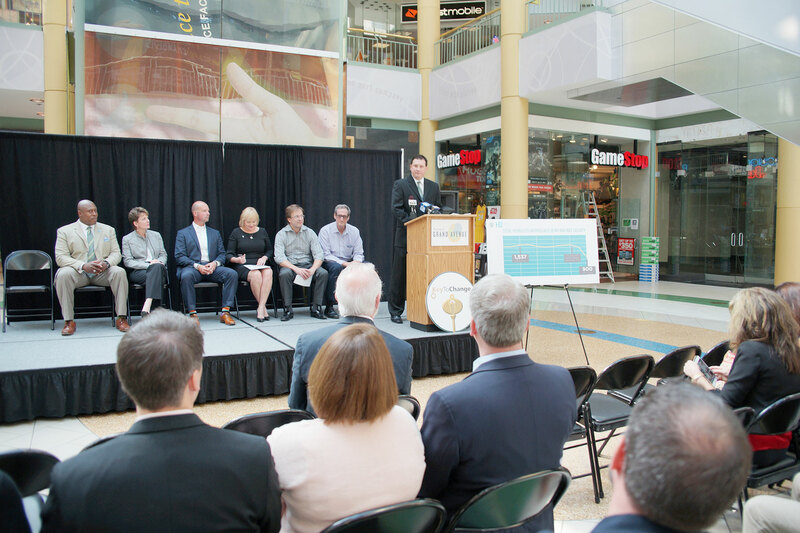 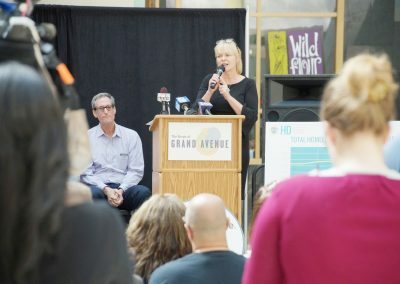 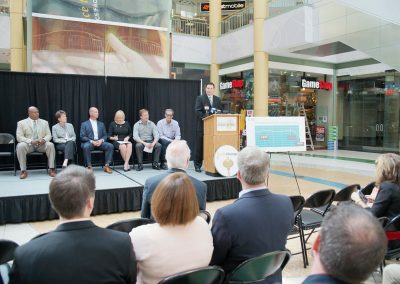 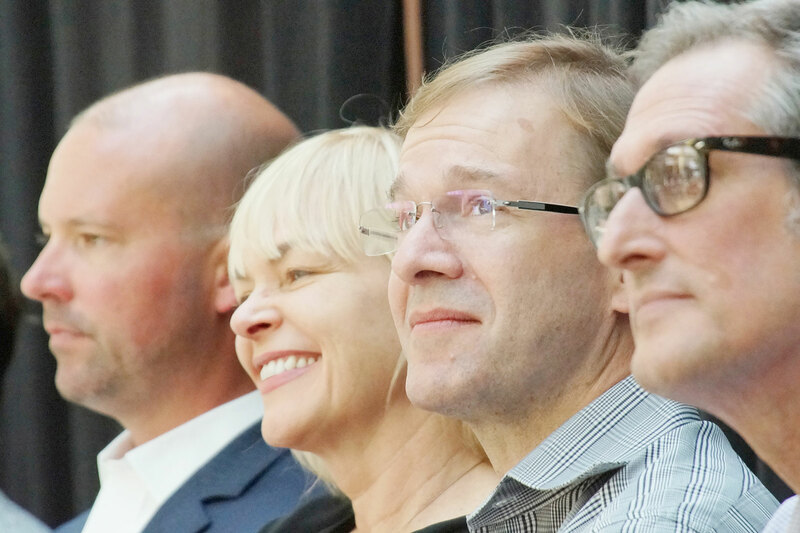 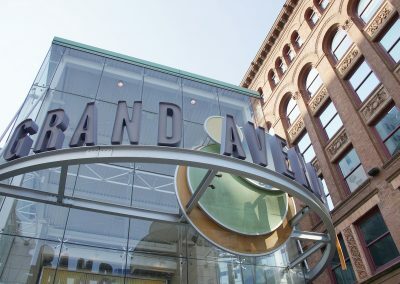 Remarks at the press conference were made by Beth Weirick, CEO of Milwaukee Downtown, BID #21; County Executive Chris Abele; Steven Mahan, Director of the Community Development Grants Administration for the City of Milwaukee; Tony Janowiec, Owner of Interstate Parking Co. and Co-Owner of Grand Avenue Redevelopment; Kathryn Dunn, Vice President for Community Investment of Greater Milwaukee Foundation; and James Mathy, Housing Division Administrator for Milwaukee County’s Department of Health & Human Services.